← What’s Wrong with Google? We bought our new house in the Spring when all sorts of plants were coming back to life in the thirty-year-old gardens. Some Texas plants I have learned but this place has plenty of new ones. In the shade of the cypress tree, I found little green bamboo sprouts, Virginia creeper, some type of wild grape and the saddest hostas I’ve ever seen. Near the pond, I found kudzu and orange trumpet vine and honeysuckle. As the season matured and things bloomed, I identified more. The bamboo, known for its tenacity and ability to dominate, had crept under the foundation wall and sprouted inside the atrium. I noticed it still didn’t have any leaves, though it was waist-high. How odd. By mid-summer, there were still no leaves, it wasn’t over four feet tall and I was pretty sure it couldn’t be any sort of bamboo. In places where the garden hose got dragged through, the “bamboo” sprouts broke. It was hollow and tough but it was not bamboo! The bamboo I’ve planted and worked with is only soft until it reaches about 5 to 6 inches high. That’s when I could thin it out and eat the sprouts. After that, anything growing amiss took a saw blade to remove. 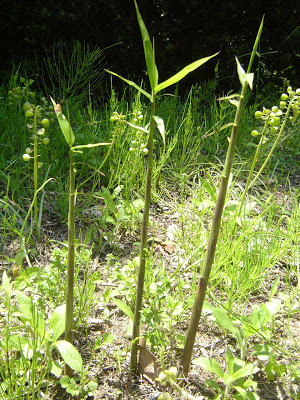 Bamboo also grows a couple of inches a day in the spring. A tiny two-inch sprout will be ready to eat that evening. Tomorrow will be too late. Bamboo quickly grows into a strong, flexible cane, used for fishing poles in the American South* and as cheap, dependable scaffolding in China**. This “bamboo” never reached more than 3/8 inch in diameter, which is smaller than any I’ve seen and too limber for a fishing pole. The former owner, the gardener who planted all this, left behind a book on native Texas plants. Looking through the handy garden guide, I stumbled across a photo and description of our mystery plant. It is Equisetum hyemale affine, also known as horsetail or scouring rush or bottle brush. Though it likes moisture and shade, it is resilient. Dragonflies like to lay their eggs on it. Dragonflies eat mosquito larvae. This is good. 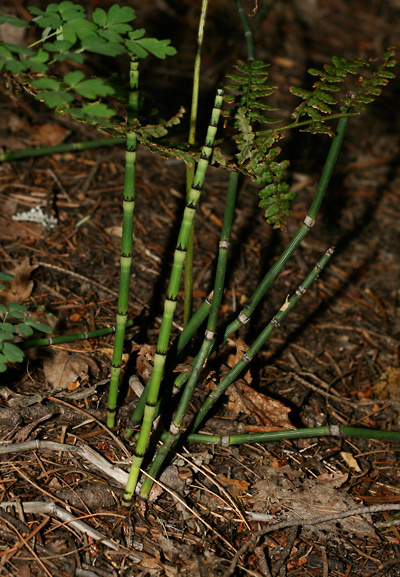 Horsetail is a first-class source of silica, a mineral humans need and are often lacking. It is either ground into capsules or brewed into tea. It’s quite useful but it is not a vegetable; it is not bamboo. I felt a little silly when I realized my mistake, wondering how many people I’d told we had bamboo in the flower beds. Misjudging plants or people or situations makes a person leery, maybe timid to speak, perhaps even suspicious and cynical. I’ve misjudged people before, trusted mostly, because that’s my nature. Mistakes and their consequences have led me to be a tad more cautious but I refuse to become jaded about character. Like the plant in the garden, sometimes attributes and moral fiber take time to show, to develop, and to reveal their true colors. Maybe next time I find “bamboo,” I will use more disclaimers. *Arundinaria gigantea, known as river cane, native to U.S. This entry was posted in Short Takes on Life and tagged Bamboo, horsetail grass, human nature, misjudging character, moral fiber, plant identification, shade-loving plants. Bookmark the permalink. I saw some horsetail for sale at Walmart (or was it Atwoods?) many years ago; almost bought it but got to thinking, the only wet place had to plant it was near the pond and I didn’t want it to take over the pond. That’s amazing that a regular retail outlet would stock such an unusual plant! I understand that it can become invasive. In certain climates, people have it as a lawn weed. But not here, where most of our soil is alkaline and typical summers are dry. Here’s some ways to get rid of it, should you ever decide to try a plant or two: http://homeguides.sfgate.com/eradicate-horsetail-21750.html I also read that in the lawn it can be eradicated by regular lawn mowing.